Introduced to music at a very early age, Valerie Milot studied the piano for several years before choosing the harp at the age of ten. 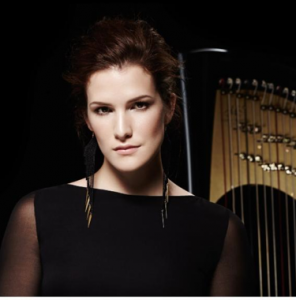 Although to most people the harp evokes romanticism and delicacy, Valérie sensed in the instrument an untamed energy. As a young adult, she began to devote herself exclusively to her chosen instrument, developing a powerful playing style and bringing out its unsuspected versatility. She went on to complete her studies at the Montreal and Trois-Rivières Conservatories of Music, where she has taught the harp since 2015. 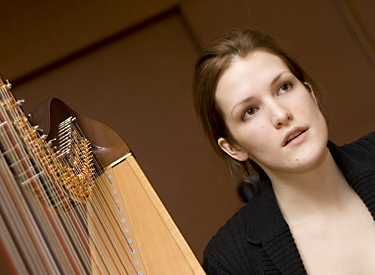 In 2008, Valérie graduated with great distinction from the conservatory and was awarded the Prix d'Europe. She was the first harpist in one hundred years to be awarded this bursary, which enabled her to study in New York under Rita Costanzi. She went on to win many other prizes: Radio-Canada's Revelation of the Year, a performance prize at the International Harp Competition of the Cité des Arts de Paris, the Young Soloist Prize of the Public Francophone Radios, the Discovery of the Year award at the Opus Prizes, the Louis-Philippe-Poisson Performing Arts Award of the City of Trois-Rivières, for her standing both nationally and internationally, as well as three Adisq Gala nominations. Valerie Milot has been Soloist in Residence with the Orchestre Métropolitain de Montréal, She has recorded 7 discs on the Analekta label. In her latest work, Orbis, she pushes the boundaries of her style. The pace of a professional musician's life can be dizzying. Valérie finds the balance she needs in the enjoyment of life's simple pleasures and in her deep attachment to her community. She gets her energy and sensibility from surrounding herself with her family, her (slightly chubby) cats and especially her darling Simone, who calls her "maman", which is the sweetest sound in the world. Mahler wrote his Fifth Symphony in the summers of 1901 and 1902 in his summer retreat at Maiernigg, on the shore of the Wörthersee in southern Austria. There he had a small composing cabin on a hill behind his villa, where he could work undisturbed. Mahler needed a peaceful refuge from life in Vienna: in April 1901 he was dismissed by Vienna Philharmonic after three stressful years when the institution’s usual politics were intensified by increasing anti-Semitism. He still held his other position as director of the Vienna Court Opera, but it too was rife with political intrigue. Also, while working on this symphony he met Alma Schindler and married her in March 1902. Although they remained together until Mahler’s death in 1911, their relationship was tempestuous, passionate but shaken by frequent and violent quarrels. The Adagietto, scored only for strings and harp, reflects both the inner peace Mahler found in Maernigg’s pastoral tranquility and the more romantic, idealized aspects of his love for Alma. It recalls the simplicity and contemplative spirit of his earlier works, especially the textural and harmonic character of his song “Ich bin der Welt abhanden gekommen” (I am lost to the world ... I live alone in my heaven, in my loving, in my song). Alan Hovhaness was a pioneer in combining Eastern and Western musical idioms long before this became a common practice. Along with Messiaen, he is one of the 20th century’s true originals, writing in a distinctive voice that can be mistaken for no other. He was also extremely prolific, writing more than 500 works including 67 symphonies, many choral pieces, and concertos for a wide range of instruments. Born to Armenian and Scottish parents who were uninterested in music, Hovhaness began composing secretly while still a child, and by his twenties had developed proficiency even in difficult aspects of composing such as counterpoint. His interest in the East began when he heard performances of Indian music in Boston; it grew when he was hired by an Armenian church in a Boston suburb, and by 1943 he steeped in the Armenian music of his father’s ancestors. This inspired him to develop his typical long-breathed melodies over static drones - a harbinger of the 1960s Minimalist style, and his signature ‘spirit murmur,’ clouded textures which anticipated the works of Lutoslawksi and Ligeti as well as the indeterminate experiments of his friend John Cage. The Concerto for Harp and String Orchestra is a beautiful exemplar of Hovhaness’s ability to create an atmosphere of mysterious calm, grounded in a love of the natural world and appreciation of its positive effects. El Dorado was composed in 1981. This work is like listening to music of the Baroque, for the language is very much the same. This is not to say the music is not new; the first few bars will tell you that. But it is constructed from the same building blocks as were the works of the Baroque masters, except the repetitions and sequences are longer and within a much more lush romantic vein. This is part of the attraction of El Dorado, the magic that lies in its capacity to remain elusive. Its motoric drive propels the listener on a journey of distant yearnings and memories, a paradox of the palpable and yet unattainable. 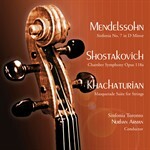 Shostakovich used string quartets to express his innermost feelings, embedded within structures of symphonic depth. Shostakovich wrote his String Quartet Opus 118 in the summer of 1964 at the Soviet composer’s retreat in Dilizhan, Armenia, during a period of relaxation and optimism. Vassily Shirinsky, first violinist of the Beethoven Quartet who gave its premiere in Moscow in November, wrote that it "is one of Shostakovich's most joyous and optimistic works. Neither the tempestuous second movement and the sorrowfully brooding third, nor the dramatic collisions in the development section of the finale can affect the generally bright and jubilant mood of this Quartet." The opening movement is a quiet one, with a main theme of descending arpeggios and a morose second theme introduced in the cello’s low register. Many of this movement’s motifs re-appear in later movements, albeit in altered forms - a unifying tactic Shostakovich favoured, and often used much more obviously. The second movment Allegretto is a fierce scherzo, assaulting listeners with violent dynamics, tense harmonies and inescapable rhythmic momentum. Harking back to the Baroque, the Adagio is a passacaglia, eight variations and a coda based on an expansive theme sung by the cello in its first bars. The finale, following without a pause, combines three themes in a large-scale sonata form: a march-like tune played by the viola, a lyrical motive also introduced by the viola above a bare, monotonous drone in the other instruments, and an expressive melody in all three lower lines under a pizzicato, mandolin or balalaika type accompaniment in the first violin. All three weave together in the sonata’s development before a sudden, lovely surprise - a dramatic and beautiful reappearance of the passacaglia theme from the previous movement. The tranquil spirit of the passacaglia tempers the finale’s rhythmic energy and prepares the way for the return of its lyrical second theme and then one last surprise: the themes of the first movement are recalled and die away to bring this magnificent work full circle to a satisfying close.